It is not news that actor Steve Carell is set to leave the cast of the NBC hit program, “The Office,” at the end of this season. Ever since the show began seven years ago and Carell was the star on a big stage for the first time in his career, he has been gaining popularity throughout the entertainment world and has been getting more and more offers to do movies in Hollywood. But in the last few years, the offers have increased for Carell to appear on the big screen and after seven seasons of “The Office,” Carell is ready for a new challenge. While his departure from the show leaves many worried about how well it would do without the presence of the star of the show, the popular television program does have numerous characters that are all different and have personalities that the fans of the show enjoy on a weekly basis. And just in case the show might suffer due to Carell’s absence, executives in charge of the show have made a few phone calls to bring in new star power. 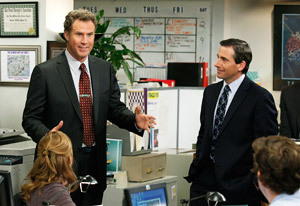 Will Ferrell has already premiered on the show and is likely to take over Carell’s spot for the remainder of the series. However, Ferrell is not the only name coming to the show. In the season finale, which will be in the form of sixty minute special on May 19th, other Hollywood actors will join Ferrell in an episode where Carell’s character, Michael Scott, will be leaving and his replacement will be chosen. Ray Romano, James Spader, Catherine Tate, Ricky Gervais, and Will Arnett are also reported to be appearing on the season seven finale. In addition, it was reported on Friday that Jim Carrey is also going to be on the finale. To most, it seems clear that Ferrell is going to be the one to replace Carell. However, only executives on the show know for sure.